Driving from Paris to Saumur early Wednesday morning I had to think back to my childhood days when I found the horses with these pink and golden or black and white bridles very fascinating, but didn't have a clue what it was all about. Twenty-three years later I was on my way visiting them. It was funny to think back on that memory and 3 hours on an empty motorway gave enough time for that. In older books one can see the horses of the Cadre Noir show the airs above the ground in front of a picturesque historical building, the École de Cavalerie, or giving displays in the historical Manège des Écuyers in Saumur. Though one may suppose an academic school with that tradition has to be located in such appropriate buildings, it isn’t like that anymore. Since 1984 France’s most prestigious riding group isn’t housed in Saumur itself, but some kilometres outside at Terrefort where there is one of the largest properties for equitation in the world, the French National School of Equitation (ENE). It was founded in 1972 and the Cadre Noir, after the French cavalry closed in 1970, has been housed there since its inception. I had never been there before, but Joy had taken part at the CDIO with her horse Dreamer in the spring of 2010 and knows the way. The National Equestrian Centre, which together with the Haras Nationaux recently formed the “Institut Français du Cheval et de l’Equitation”, is located in the forests about six kilometres outside Saumur. To get there we have to drive through beautiful rural countryside and finally reached the forest where left and right from the narrow street horses were grazing in paddocks. We also passed two tack shops on our way, so. Saumur isn’t called “The city of horses” for nothing! We parked the car in front of the guarded entrance of the estate. Hundreds of horses are stabled here in several big stable buildings. As it was late autumn the weather was moderate and there was no sunshine in sight. Everywhere fallen leaves covered the ground and I tried to imagine how wonderful it should have been here in spring or summer or even on a sunny day in the autumn or winter. Carde led us to the big indoor school where the main rehearsal took place. Joy and I took a seat in the “Grand Manège”. The modern and huge indoor arena has several rows of comfortable seats on three sides. The illumination and surface are so light that we had the feeling we were virutally outside. The school does not resemble the palatial Hofburg in Vienna and the modern facilities seem to deny the Cadre Noir's long tradition. It is one of four still remaining academic schools of dressage in Europe and many of France’s Olympic riders in all three discipline have been trained and have ridden here in the past or still do nowadays. The outdoor school at the Ecole de CavalerieIts history goes back to 18th century post-French Revolution. After the Napoleonic Wars the mounted troops in France had to be rebuilt and Saumur was chosen as the location of the new cavalry school. 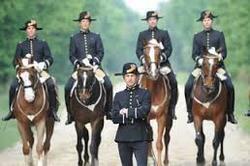 Riding masters began training cavalry officers until they themselves had the skills to teach the next officers. During this time the famous black uniform, which members of the Cadre Noir still wear today, came into existence to distinguish the masters from the pupils who wore blue uniforms. Today this uniform is the hallmark of France’s most famous riding group. The Cadre Noir, unlike the SRS, used to be a cavalry school, but at the same time has always practised academic equitation. After the disappearance of the cavalry in France the tradition was upheld via a new challenge: the Cadre Noir increased its number of public appearances to demonstrate academic riding. At the beginning of the 1970s the recent location was established some kilometres outside Saumur and the National School of Equitation was founded by the French Ministry of Youth and Sport to organise riding instructor courses. The Cadre Noir changed from a military to a civilian organisation and its new task is to train riding instructors and horses, to compete in the Olympic disciplines up to Olympic Games, and to give several displays in France and abroad. The impressive Grand Manège is 83 metres long and 32 metres wide. It provides a seating capacity for 1500 people and is the largest indoor arena for riding in Europe. It is part of a complex called “Prestige” which was built between 1982 and 1986 to house the horses of the Cadre Noir. The rehearsal was already in full swing when we got there. Several ecuyers were standing on the ground, some were preparing a jump with yellow and black poles in the middle of the arena while another had a chestnut horse in a double lunge. With classical music from a tape playing in the background the ecuyer made the lovely chestnut canter and directed it to jump the formidable fence in long reins which he did beautifully. The gelding wore a full cheek snaffle and a lunging girth. Through its carbines the long reins led to his ecuyer’s hands so the trainer could more easily direct his horse to the fence. This jumping performances are something special and cannot be seen in other academic schools. They show that the Cadre Noir has a military heritage and that its riders not only concentrate on dressage, but also on the other Olympic disciplines. A camera team was filming the entire rehearsal, most likely to analyse everything later on. Next to enter the huge arena was a woman on a bright bay horse. I recognised her as Nadège Bourdon who was one of the featured ecuyers in a TV production called “Ecuyers du Saumur” shown in Germany on ARTE channel. Bourdon, who has a classical seat, showed all the Grand Prix movements in a solo appearance. She is one of three women currently at the Cadre Noir. The first woman joined this former military elite group in 1984, remarkably much earlier than at the SRS which only started to accept women in 2008. Three new horses with some ecuyers on the ground entered the arena. One of them wore a huge padded cavesson with two big rings left and right to the soft noseband over the bridle. It looked like the horse would be tied between the pillars and so it was. The bay was saddled and had a double bridle under the cavesson. One of the écuyers tied him between the two wooden pillars which are padded in case a horse touches it with its sides while executing a croupade. One held the reins while another ecuyer touched the horse with a whip and animated him to do piaffe. The music played in the background was appropriately dramatic. The two other horses, another bay with a big white blaze and a beautiful liver chestnut, were each accompanied by two écuyers on every side and one behind. Unlike in Vienna the sauteurs performing in hand do not wear side-reins, but are in a double bridle. Both executed the airs above the ground Saumur-style: courbette, croupade and capriole which are a heritage of the School of Versailles. It was impressive to watch indeed and different from Vienna, Jerez or Lisbon. After the “sauteurs” had left some helping hands carried a well-laid table, a chair and a post into the Grand Manège. Joy and I exchanged puzzled looks and even more so when two identical looking greys with jumping equipment came in. We recognised Colonel Jean-Michel Faure, ecuyer en chef since 2006, mounted on one of them, looking very much like John Whitaker on his legendary Milton. Faure headed straight at us, halted his horse and welcomed us in his “living- room”. Joy mentioned in French that he is riding the reincarnation of Milton which caused a smile. I wondered if Milton had ever jumped such fences in his life, but his doppelgänger did it brilliantly! Both greys tackled the narrow white chair as well as the wide table and the extremely narrow post with confidence and jumped them nicely in a round frame. It was a really enjoyable display, especially because both horses were rewarded by some ecuyers feeding them treats next to the table they had jumped earlier. Though we had not attended the rehearsal from the very beginning I was quite sure we hadn’t missed the best part when an outstanding looking Lusitano horse entered in long reins, a young lady behind. Everybody could see that this horse was born for dressage and nothing else. His ability to carry weight and the typical forehand action of an Iberian horse created an impressive picture. First the stallion seemed to be a bit fast in his movements, forcing his female companion to make some effort to follow, but then he settled down and it became the most beautiful display. A display in long reins is always a bit crucial as it easily reveals misunderstandings. I remembered the long rein displays I had seen in Vienna and those from the Royal Andalusian School when they visited Germany years ago. No, this Alter Real in Saumur should not hide behind them, he is a real dancer. I enjoyed every minute of his wonderful elevated and proud movements and I was sure he would be a crowd pleaser wherever the Cadre Noir appears in the public. Last part of the rehearsal was the traditional “reprise des écuyers” with the ecuyer en chef leading the group of riders. The écuyer en chef is the director of the Cadre Noir, though he is not necessarily a dressage rider. Colonel Faure used to be a very successful jumping rider and like all his predecessors he was appointed by the French minister of sport after being suggested by the minister of defence. So far only members of the military held the office, but it could also be a civilian rider. Decisive is that the écuyer en chef is an outstanding rider in one of the Olympic disciplines and owns a knowledge that enables him to guarantee the ethics and doctrines of the Cadre Noir. The chief riders at the Cadre Noir have been influenced by the most famous French riding masters, most notably Baucher, Comte d’Aure, Decarpentry and L’Hotte. The latter stamped the famous words: “Calm, forward, straight” (“Calme, en avant, droit”) which still is invaluable advice for schooling horses. The quadrille started with the riders on the centreline parting to left and ride in half-pass, pulling their hats off to greet. Though nowadays the gesture is meant to greet the crowds, in the past it used to be there for honouring military authorities. A quadrille is fascinating in the way the riders part and come together in different difficult figures and in different advanced movements up to passage. I had to admit it was one of the most interesting quadrilles I have seen for a long time. The rehearsal was over and Joy and I were wondering if we should wait or head back to the office. It is easier visiting a single rider than a huge institution like this, wo we decided to wait a little bit and shortly after Colonel Faure appeared and asked us to follow him to his office in the building nearby. Back at the administrative building we entered the stylish office of the ecuyer en chef. which was not too big, but beautifully furnished with many framed black and white photographs of former members of the Cadre Noir on the walls. We sat down on two chairs opposite Colonel Faure. Fabien Godelle joined us. He has already competed internationally in dressage and represented France at the 2005 World Championships for young dressage horses in Verden. I had two very competent interview partners in front of me, but unfortunately they spoke as little English as I do French and Joy had to translate all the time. At the Cadre Noir the horses not only do dressage, but also jumping displays and we wanted to know how they select their horses for the different groups in which the ecuyers train their horses. Colonel Faure reported that there is a commission responsible for buying young horses. Every year this commission buys thirty 3-years-old horses for the Cadre Noir which are split between the competition group and the apprentices. Unlike in former times when they only bought French bred horses foreign breeds are allowed now since several years. The horses are judged in hand and on their gaits. Fabien Godelle added that dressage horses are also bought in Hanover. His chestnut Liaison (by Londonderry) is a good example. The funds for buying these horses come from the Ministry of Defence and the Ministry of Agriculture as well as from the French Equestrian Federation (FFE). Though horses are bought for different purposes it is possible that a young horse might change discipline if it offers talent for the other division than the one intended. Young horses are assigned to a rider for at least one year. Every year the development of the horses is assessed and the more experienced horses are chosen for the public appearances of the Cadre Noir. I wondered whether there is a tradition to keep an Iberian horse in the pack as well because I remembered the fantastic Lusitano greys which once belonged to the Cadre Noir and more recently the bay we saw in the main rehearsal. The Colonel denied it, but of course they are great dressage horses and a welcome addition. The bay I liked so much was a gift from Felipe Graciosa, the ecuyer en chef of the Portuguese Academy in Lisbon. Although the horses in their beautiful black, pink and golden gala “dress” tend to look quite identical the Cadre Noir has had some real stars like the Lusitano Odin or the chestnut Valrose who was a fabulous “sauteur” (=horse showing the airs above the ground). I asked what happened to them once they get too old to participate in the appearances of the Cadre Noir? “The horses are retired depending on their health and level of fitness. Usually they quit the Cadre Noir at 17 or 18. We give them in good hands where we make sure they enjoy a life in the pasture. The mares are used for breeding,” Faure reported. We switched topics because it is natural that a group like the Cadre Noir not only needs talented horses to maintain the high standard they are famous for. I asked how one can become a member of this highly esteemed group of black dressed riders? “We only allow graduated riding instructors under 30 with at least two years of experience in the job and significant results in one of the Olympic disciplines to apply. We have about 60 applicants each year and only three are chosen in the end," Faure explained. If somebody is one of the few lucky chosen ones he has to undergo a probationary year. After they become “trainee riding masters” they are allowed to wear the treasured black uniform. The following three years they spend on becoming a “riding master” and work on the training of the "sauteurs." Unlike in former times most of the members of the Cadre Noir are civilians and only a few still belong to the French military. There are some specialities which are only shown at Saumur. “We are the only school which shows airs above the ground in a group,” Godelle mentioned. Actually these horses show the courbette in a line or on a circle and at almost the same time which is really remarkable. The group of sateurs is always a crowd pleaser wherever the Cadre Noir appears and it needs special horses for these airs above the ground. “They start working as 5 years old. Not every horse is suitable for this work, it requires a special temperament and a good health," Godelle added. It is paramount that these horses are able to put weight on their hind legs sufficiently to execute the three airs above the ground shown at Saumur. They get a classical training and have their first appearances the earliest at the age of 9. Usually the croupade is the first jump taught as the weight is more forward. The capriole is the most impressive, but also most difficult air. The horse leaps vertically in the air and kicks out with its hind legs at the same time. To be able to do so it has to built up enormous energy in a kind of a rocking canter called “terre à terre”. When I inquire about the programme the Cadre Noir shows to an increasing public (“We had more visitors in 2010!”) they said that it varies from year to year. “We want to develop and so we are flexible in the programme. Of course there are traditional parts, but we also try to present something new every year,” Colonel Faure explained. The most important questions were answered and we thanked both charming men for spending their lunch break talking to us. I asked to do a photo of both in front of the impressive wall of photographs for our readers and after that Godelle offered to guide us around the property which we appreciated very much. The Cadre Noir is one of the biggest equestrian facilities I have ever visited in my life with five indoor and 15 outdoor arenas as well as 50 km of gallops on about 300 hectares. We followed Fabien Godelle and headed from the administrative building to the “heart” of the property, the beautiful outdoor arena named “Carrière d’Honneur” of Olympic size opposite the Grand Manège. It is the location of the CDIO Saumur in the spring. The outdoor arena is surrounded by stable buildings on two sides. In one of them the horses of the Cadre Noir are housed and in the “Decarpentry” complex the dressage horses are stabled. All the stables are modern with bright outdoor boxes in which the horses are fed automatically several times a day what suits their digestive system very well. About 60 grooms are responsible for approximately 330 horses on the property. Godelle opened the tack room opposite his office and we admired the beautiful traditional saddles for the horses, the show bridles and looked at the impressive framed photographs by in-house photographer Alain Laurioux, which decorated the wooden walls. I especially admired the beautiful curbs which have an engraved sun like King Louis XIV. 's emblem. Then we went to the two other fully equipped complexes, “Valat” for the jumping horses and “Bouchet” for the three-day eventers of which some had even become Olympic champions some years ago. Every complex has a huge indoor arena and outdoor facilities including horse- walkers. The National Equitation Centre seemed to have it all: A veterinary clinic with three vets where operations can be done, several farriers who shoe the horses every 4 to 6 weeks and even a basin can be found. At the edge of a forest we saw the first of hundreds of cross country fences. Though the Cadre Noir is mainly connected to dressage some of its members are world class 3-day eventing riders and an important CCI*** is held annually. The only thing I was missing were paddocks or fields because also high performance horses would enjoy this kind of freedom for at least some hours a day. We walked back to the administrative building. Joy continued talking to Fabien Godelle about dressage, while I walked past a statue of a horse and entered the beautiful shop of the National School of Equitation. There visitors can buy many souvenirs, books and DVDs relating to France’s foremost riding institution. And how lucky I was that the two nice ladies spoke English so I could order two beautiful posters and buy some postcards and a book. With a huge shopping bag and 60 Euro less in my wallet I joined my friend again. We thanked Godelle for his kind company and time for giving us a guided tour of his working place. Definitely one of the most beautiful facilities in the equestrian world!